At first glance an audiogram may look simple and straightforward. Delving into interpretation and implications of the audiogram, however, leads to a whole different picture: the mysterious world of audiology. As many more parents have been sending me their child’s audiological reports to try to make sense of them, I have become acutely aware of how little parents are being educated by their audiologists regarding what they are testing, what the results mean, and why their audiologists make the recommendations that they do. It’s not a simple matter of reading over the report that the audiologist writes. This is the reason I frequently pass along your reports for interpretation to my “audiology guru,” a university professor of audiology. As a speech/language pathologist, there are many finer points to hearing tests that I do not understand nor am able to identify. As an expert in the field, my audiology colleague looks at all of the pieces, reads between the lines, and gives me valuable insight to pass along to you. Ideally, this is information that you should expect your audiologist to be providing to you. However, as it seems that this is not often happening, it becomes more important that you press your audiologist to answer your questions. Being able to ask questions requires that you have an idea of what you are asking about. Because hearing tests seem to be such an area of misunderstanding, yet are often a vital piece of information when trying to understand our children’s issues, I thought it would be useful to provide you a few basic definitions and explanations of the different hearing tests that you are most likely to encounter. For the purposes of this article, I will not get into the realm of interpretation of results. I will simply explain what the tests are. The audiogram is likely the most familiar hearing test to you. The audiogram is a graph representing at what loudness levels (measured in decibels, dB) a person hears tones of different pitches (measured in Hertz, Hz). Typically, the audiologist plays the tones from an audiometer to headphones so that the right and left ears can be assessed separately. 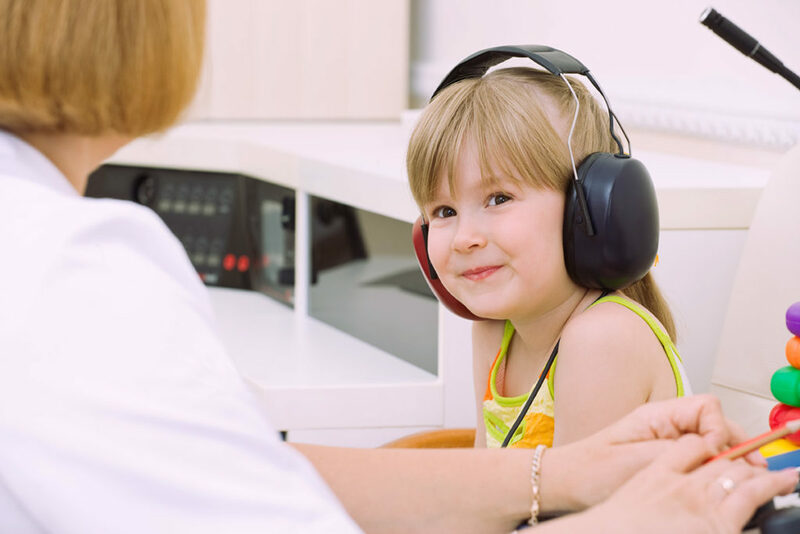 However, for very young children or children who are not readily cooperative with headphones, audiologists often test them in the sound field. This means that the audiologist presents the tones to the child through a loudspeaker in a sound booth and then watches for a visible response from the child suggesting she heard the sound. If the audiologist notes responses, she will write them on the audiogram; however, she will not be able to determine if the child heard the sounds with only one ear or both. Audiometry often includes testing with bone conduction, masking, and speech recognition. These tests give the audiologist more information about the severity and types of hearing loss. For the sake of the present article, I will not elaborate on the specifics of these aspects. The human ears of most children can hear frequencies up to 20,000 Hz. Although our speech sounds fall within a rather limited range within these 20,000 frequencies, hearing the intricacies of language and adequately perceiving the world around us depends, in part, upon properly hearing the full range of sound. Even so, a typical audiologist tests about four to six different frequencies in each ear (covering about the pitch range of a piano); though some audiologists test a few more. So, how comprehensive can a test be that gives us a snapshot of how we hear only a handful out of 20,000 frequencies? This sample of frequencies does leave some gaps; especially if the audiologist does not also test how well a child can detect and understand speech. A potentially greater limitation of the audiogram lies with the audiologist’s training and skill in performing behavioral hearing testing of children who are very young or who have developmental disabilities. My impression, as well as that of my audiology colleague, is that some audiologists give up too quickly when a child is labeled as “difficult to test:” the child may cry or will not initially volunteer a response to sound. A skilled audiologist will be patient, work more creatively with the child, or try testing the audiogram again within the next week. Some audiologists, however, recommend the child be retested a few months later when he is more mature. Other audiologists may recommend the child have a different hearing test, like auditory brainstem response testing (abbreviated ABR or BERA). As discussed later, these tests usually are more expensive than getting an audiogram and often require that the child be asleep or sedated. Patience, perseverance, and a little imagination will often yield valid audiograms on most so-called difficult-to-test children and make other, more expensive tests unnecessary. Tympanometry is a quick, easy way to assess the status of the middle ear behind the eardrum. An audiologist obtains a tympanogram by placing a probe in the ear canal for a second or two. It takes measurements such as the volume of the middle ear and the movement of the eardrum. A tympanogram does not tell you directly how well your child hears soft sounds or understands speech. However, it is an important test because the results indicate whether or not the middle ear is functioning normally. Certain results suggest fluid is in a child’s middle ear. That is why many of you have had your evaluator recommend that you take your child for a series of these simple tests. An important point to keep in mind is that a tympanogram provides you with information about your child’s middle ear at the moment the test was performed. If you wish to rule out the possibility of chronic fluid that may have gone undetected, you need to have several tympanograms done at specified intervals (for example, every two weeks for 2-3 months). This will give you a better idea of what is happening with your child’s middle ear over time. Another commonly and easily used measure of hearing are OAEs. OAEs are sounds produced by the cochlea (also called the inner ear) in response to a sound. Sounds are presented through a microphone in a probe in the ear canal. The sound passes through the middle ear, and into the cochlea (also called the inner ear). Tiny hairs in the cochlea produce a sound echo in response. The audiologist measures this echo from a microphone also in the probe in the ear canal. Normal OAEs imply normal function of the outer hair cells of the cochlea. However, because the sound has to travel through the middle ear before it is measured in the ear canal of the outer ear, absent OAEs may or may not indicate a problem with the cochlea. If there is a problem with the middle ear, this can reduce or remove the echo. This is a good example of why audiological test results must be looked at as a big picture, not simply in individual pieces. Assessing the tympanogram in conjunction with the OAE makes the results of OAE testing more clear and meaningful. Acoustic reflexes are contractions of tiny muscles in the middle ear: the stapedius and the tensor tympani muscles. Acoustic reflexes normally occur in the presence of loud sounds. That is, the ear has these protective reflexes to dampen loud sounds and thus protect the cochlea from damage. Audiologists typically test acoustic reflexes immediately after obtaining tympanograms. As with tympanograms and OAEs, acoustic reflexes are measured through a probe in the ear canal. They are easily and quickly measured when a child is quiet. The absence of acoustic reflexes often during testing suggests a problem with the middle ear, the inner ear, or the auditory nerve. ABR is a hearing test mainly used for screening hearing of newborns. ABR is used with older children when the audiologist is unable to obtain valid information by an audiogram. As suggested earlier, a complete ABR test of “difficult-to-test” children is relatively expensive and too often over-used. A child must not move much when administering the ABR; accordingly, the child usually must sleep naturally or be mildly sedated during the test. A series of clicks is presented to each ear through earpieces inserted into the ear canals. Brain wave activity is then measured in response to the clicks. Because ABR requires no visible response to sound on the part of the child, it is not considered to be a behavioral hearing test like an audiogram. That is, ABR provides an indirect estimate of the individual’s hearing level and usually yields less information about a child’s hearing than a valid audiogram. Audiology is complex field that requires the ability to look at different diagnostic tests together in order to adequately assess a child’s hearing. You cannot expect to understand all there is to know about interpreting your child’s hearing test results; I certainly do not. If your audiologist does not provide you with adequate education, you must take the initiative and ask as many questions as you need to understand the meaning of your child’s hearing tests. You must also ask about the rationale when your audiologist makes recommendations for additional testing. The more informed you are, the better equipped you are to make decisions regarding what your child really needs. Before seeing an audiologist, think through the questions that you might want to ask him/her. What do you want to know? Write your questions down and take them with you. I am including some possible questions here that you may want to include; but be sure you get the information that you want to know. What type of tympanogram does my child have? What does the tympanogram suggest? What is my child’s hearing threshold in the right ear? Left ear? Are additional tests being recommended? If so, what do they test? How would this additional information be helpful?